This is my second, and possibly last New York post. I needed to write these to keep things straight. Vacations have a way of addling your brain. Yesterday we went to Sanfords for brunch. My, it was tasty. It is a 24 hour a day place, with probably the same menu all day. The menu has a set price for all items, that includes coffee and one drink. I had butternut ravioli with a cream sauce with sage and almonds. My DH had a skirt steak with eggs and the Boy had a grilled Gruyere cheese sandwich with eggs, although just naming the last two without describing them is not doing them justice. After brunch we separated. DH went shopping and back to The Boy’s place, while The Boy and I went to Manhattan to see where he works and Greenwich village. 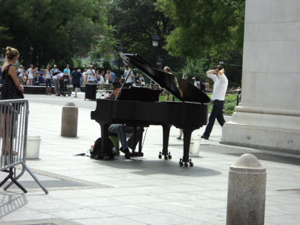 We saw Soho and Washington Square, where there was a man playing a grand piano under the arch. Apparently, playing music under the arch is a popular thing to do, the acoustics are wonderful. We saw a street fair, and a farmers market, merely blocks from each other. We bought juice at the farmers market and The Boy bought me a dress at one of the street vendors. A street fair is only a slightly more exaggerated version of what goes on in NY every day. Which brings me to fashion. It seems that everyone dresses nice in NY. Well, the girls at least. I saw so many cute outfits. Of course, much of that is that NY has a much younger demographic than here, but they have so much fashion just thrown at them. It makes me happy that the fashions now are something I like. Or maybe just seeing how good these girls look in the fashions made me like them. We finally had NY style pizza. It was very good. The Boy and DH had more run of the mill choices, but they had pizza’s displayed that had all sorts of ingredients from cheese that I never heard of before, to one that had several kinds of cheese, to ones that had so many ingredients that I couldn’t be certain what was on it. I had what looked like a veggie supreme. 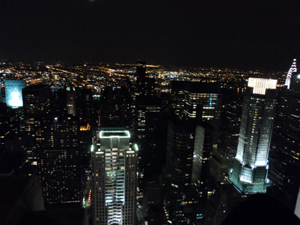 We followed that with a trip to Rockefeller Center,to what is called the “Top of the Rock”. First stop was Ben and Jerry’s. I had never had their ice cream. We then went up. There is a beautiful chandelier type installation where you first go in. I wish we had more time to appreciate it. I was thinking that there wasn’t enough time to appreciate most of what we saw here. Also, they seemed to have really taken to heart the idea of modern people having short attention spans. They do things to entertain you along the way, even in the elevator. The view from the top is spectacular. The lowest observation deck was the hardest for me, Nothing separated you from the edge but the glass. Just don’t look down. The higher two had beautiful, decorative crenelations, which kept you a bit further from the edge. I heard people cheer on one of the other decks, and The Boy said someone had proposed. There are few fat city people. I can see why. Unless you are wealthy enough to take a cab everywhere, you must walk at least a mile a day, to get to and from the subway, to go out and see things, or to get anywhere. Most people here have great legs. I really liked the city. There is so much of everything. It is the fair, a college campus, and a community event all rolled up in one. As we left, I felt a real regret to be leaving. The twinkling lights, spread out in ever changing patterns were so beautiful. Don’t get me wrong, I’m not romanticizing the city, there is a lot wrong with New York, but to me that just added to the richness of the experience. Our pilot even said to avoid JFK airport at all costs! We had a LOT of delays and problems. For awhile we were 10th in line to take off. The taxi ride there was a cliche of hurrying to the airport through clogged streets and last minute maneuvers. So we’ve taken a trip to New York City. We are definitely not city people. Rube is a word that pops into my head on this trip. We are visiting the boy, who now lives there. He has been explaining the societal norms of city living to us, to good effect, more or less. My husband still engages total strangers in conversation. Some of my first impressions of the city are that it is not what I expected, or if it is, maybe I am not what I expected. First, I thought cities were “food deserts”, with little to no access to fresh fruit and vegetables. Maybe there is a bit less access in Manhattan, but in Queens, where we are staying, there are little food markets on every corner, both actual grocery stores and fresh food stands. Of course, there are also restaurants every other building, both healthy type ones and some not so. We had excellent greek food, at a place named “Crave”. We had Dallas BBQ. We had good Thai food at the Red Basil. I can’t make a comparison with other Thai food, as this was my first try at commercially prepared. The city is a bit overwhelming in scale and scope. For a country mouse I just had to put both my personal space and my expectations of space in general on hold. It was easier than I thought. The city is just so full of everything. People, stores, dogs, streets, noise, interesting sites, restaurants, and more. We had plans of things we wanted to do. 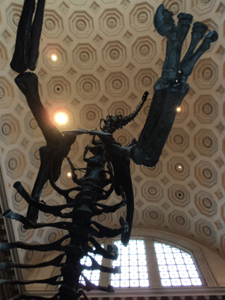 Today we were going to see a Broadway show, the Museum of Natural History and Central Park. The show we wanted to see was sold out, we tried a few other places with no luck. We spent most of the day at the museum, took a break for lunch and a walk in the park, and spent another hour there. Having spent most of the day there, it is hard to believe that we barely scratched the surface. We saw one floor, the planetarium show (awesome! Well worth it.) and a bit more of the space area. The museum is HUGE. Again, at the park, it was a case of just getting a taste of it. We saw the lake, climbed on the rocks, and took a tiny bit of a walk. 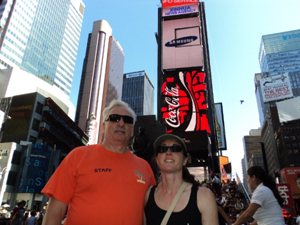 Prior to doing that, we saw Times square and Rockefeller center. We saw the NBC studio, down the road we saw the Fox studio-both from the outside. Maybe it was the influence of being surrounded by all the native New Yorkers, but it seemed rather unimpressive. Maybe it is the great effort the city puts into impressing you with itself, that it dwarfs these other attempts. Maybe I’m just too old to be awed by pomp and circumstance. OOoh, look, a famous person. Yup, looks like a person. Speaking of that, we saw an improve show with two members of the 30 rock cast, and while they were funny and it was a good show, the fact they were famous failed to wow me. I wonder if it would have been different if I’d have seen the TV show. While rent in the city is as high as everyone says, the rest of living here is far more affordable than one would expect. Clothes and food are quite reasonable. There are discount stores, thrift shops and other low priced options for anything you need. Travel is more expensive, especially for tourists like us, we aren’t going to buy a monthly metro pass. We bought some nice things, and didn’t spend much. Because there are so many restaurants and bakeries, food could get expensive, the temptation to eat out is great. Part two is coming tomorrow.